My affinity for J.R.R. Tolkien’s The Hobbit goes back a long way. In elementary school I purchased a copy of White Fang from one of those Scholastic book order flyers that got sent home once a month, and thought it was the best book I had ever read. It was a gripping tale of adventure set amid a fantastic backdrop of otherworldly (to my midwestern self) locations with a main character for whom I could root wholeheartedly. White Fang, as far as I knew at the time, was the epitome of literature. That was, until my friend Joe showed me one of his favorite books-a 300-page tale with a funny-looking green cover about a three-foot-tall munchkin. I was skeptical about The Hobbit at first, but soon found that it had everything I adored about White Fang, but so much more. I became lost in the adventures of Bilbo Baggins and his traveling troupe of 13 tawdry dwarves. I wondered at the wisdom of the wizard Gandalf, and marveled at the beauty of Imladris. I began daydreaming of journeying through the black overgrowth of Mirkwood, exploring the halls of the Elven kingdom, and sneaking around inside Erebor, the lonely mountain which was home to the malevolent dragon Smaug. I quickly devoured Tolkien’s other tales in the Lord of the Rings series, and though I never made it all the way through his other works like The Silmarillion, I remain an enthusiastic fan of his tales of Middle-Earth to this day. When Fellowship of the Ring came out in 2001, I saw it twice on opening night clutching my copy of the book tight while trying to ward off an ill stomach after eating movie theater popcorn and Coke for dinner. Peter Jackson’s interpretation of the fantasy realms Tolkien dreamed up while fighting in the trenches of World War I had me hooked, and to this day I don’t think I have seen another movie that has so thoroughly captivated me while engrossing me into an entirely different world. It was, then, with a bit of nervousness that I went into the theater last weekend to see the first in The Hobbit trilogy, An Unexpected Journey. The trailers were amazing, but early reviews suggested some problems with run time and creative licenses taken by Peter Jackson and his film crew. Would The Hobbit live up to my expectations? Would it crumple under the weight of all the extra material from Tolkien’s other books that were appended to the storyline? Would it be anywhere near as good as its forebears released over a decade ago? Soon I realized my fears were unfounded. Bilbo Baggins and his adventure were in fine hands, and after ten minutes of cautious trepidation I settled down and let myself become immersed once again in the beauty and majesty of Middle-Earth. The Hobbit is not a perfect movie. It might not even be a great movie. But it is a thoroughly captivating fantasy tale, the likes of which you have probably not seen onscreen since Return of the King. The pacing is a bit off, with the first half burdened by a great deal of exposition and backstory, often told through flashback, that seems somewhat extraneous but is critically important for understanding the larger context in which Bilbo’s tale of mischief and burglary is set. For a Lord of the Rings geek, these deviations do not serve as a distraction and in fact enhance an already familiar tale with nice flourishes that others might find extraneous. I can understand why casual theater patrons might be somewhat put off by the many inclusions in this film that seem to have little bearing on the story at hand, but I say bring ’em on. Tolkien crafted a beautifully complicated world, and if showing a bit more of it means an extra ten minutes in a theater seat then I’m all for it. Rest assured all the core elements from the book are present and accounted for, if altered slightly for the cinematic presentation. The troll campfire, the visit to the Last Homely House, the passage through the mountains, the riddle scene…they’re all here and all very well done. While some might take issue with the changes Jackson made to some of these, particularly when Bilbo and Gollum (who looks even better and more expressive than he did in the previous trilogy) match wits to determine Bilbo’s fate, I mostly just sat there with a stupid grin on my face enjoying the fact that I was getting to watch all of this on the big screen. Picking nits about changes from the source material here is kind of irrelevant for me, when the resulting film is so engrossing. 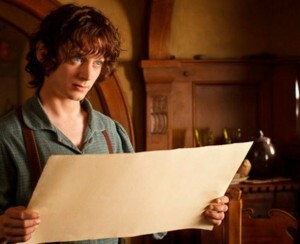 Even Frodo shows up, though his character wasn’t born yet. Don’t worry, it all makes sense when you see the movie. However, there are a few structural issues that did bother me and detract from the film as a whole. 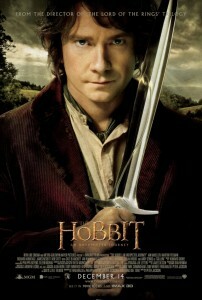 There are essentially two main characters in the film, even though the book focuses almost entirely on Bilbo. The titular hobbit is the one with whom we spend the most time, as is to be expected. 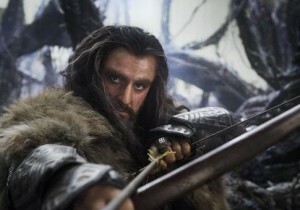 But Thorin, the leader of the company of dwarves, receive almost equal billing. He is essentially this film’s Aragorn, and a somewhat obscure enemy named Azog is brought out from the depths of Tolkien’s extended materials in order to give Thorin a mortal enemy with whom to do battle. His inclusion is somewhat of a dumbing down of the main storyline, and his pursuit of the band of treasure-seekers is rather unnecessary given the many perils the company encounters along their journey already. I can understand this from a storytelling perspective, as the Thorin/Azog battle helps propel Jackson’s version of Tolkien’s story and leads to a climax absolutely dripping with gratuitous cinematic clichés that probably appeal to the casual moviegoing types or significant others dragged to the theater against their will, but it’s something that this film could have done without. I have read more than a few complaints about the length of The Hobbit, and I must admit that this type of criticism puzzles me. I tend to doubt that few moviegoers who are even remotely familiar with Jackson’s previous Lord of the Rings movies would go in to The Hobbit expecting a 90-minute cartoon. This is heady stuff, and Jackson’s vision of Tolkien’s world is one that I enjoy letting wash over me and consume my senses. I enjoyed the almost three-hour run time, and it was filled with such fantastic scenery and interesting characters that I almost wish it were longer (and will no doubt be when it is released on Blu-Ray). As far as I’m concerned, the longer run time simply meant more movie to enjoy. The Hobbit is not the epitome of literature, and the movie is not the apex of film. But it is a good book, and this is a genuinely good adaptation. For anyone even remotely interested in fantasy movies, this is certainly one to see. For those on the fence, it’s worth a shot and you might find yourself pleasantly surprised. CGI has become an excuse for a lot of wanna-be directors to be lazy. 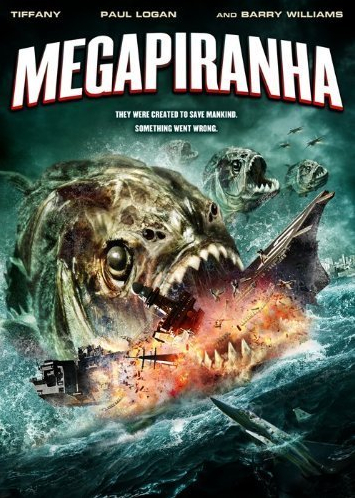 Were model piranhas so hard to come by? Would it have been so hard to use a few five-dollar air hoses to generate the thrashing in the water? Was it so prohibittive to rent one helicopter, instead of the computer-generated blob that we see, then use a split-screen to reproduce it? The one thing you can sort-of feel good about in this movie is that nothing was wasted. No good actors poured their talents into a hopeless script. No quality special effects were wasted on a stupid concept. 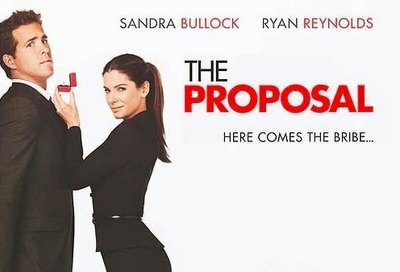 All the components of this movie deserve eachother.